Kevin Hansen wins the first victory of the season at #AbudhabiRX, the inaugural round that we can call “high tension”. Team Hansen MJP clearly dominated the weekend under the scorching heat of Yas Marina Circuit and it was the little Hansen who would take all the honors in the commissaries’ offices, as Niclas Gronhölm was relegated to second place by a 3 second penalty for an illegal action on Kevin Hansen himself. His older brother Timmy, who had dominated the first day in the Hansen MJP team car, had a great impact with the Monster Energy RX Cartel Audi S1 ​​by Andreas Bakkerud in Q3 in the area of ​​the Joker Lap. Bakkerud was disqualified after being found guilty after the commissioners’ investigation, which meant that both he and Timmy Hansen, whose car suffered extensive damage on the left side, did not make it to the semifinals. ” It was not an intentional blow, but sometimes the stewards look at us differently, so I have to accept it, keep going and fight in Barcelona, ​​”said Niclas Gronholm disappointed by the final decision of the race stewards. 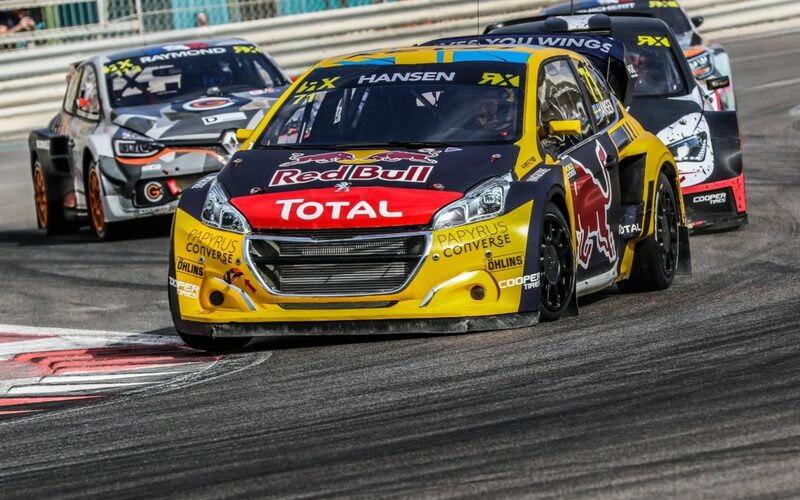 Niclas Gronholm was not the only one penalized in the exciting final of the AbuDhabiRX since Janis Baumanis was also relegated from his position being in the fifth final position for the benefit of the pilot. EKS Audi Kristzian Szabo The final was closed by the German driver Timo Scheider and his Seat IbizaRX that after a very competitive weekend did not have much luck in the final. The Yas Marina Circuit was a spectacular place to organize our first round of World RX under lights The action on the track also showed that we can expect very close races during the rest of the 2019 season. The Circuit de Barcelona-Catalunya takes over and will be the center of the spotlight on days 27 and 28 of April, which will be the fifth edition of this test that landed on Catalan lands in 2015.